Arleta Lucht died peacefully with her family by her side shortly after her 80th birthday. Her parents were Wilbur and Creta Schneider of Canby. She was married to Paul Lucht of Molalla, Oregon. Arleta worked with her husband on their farm for much of her life. 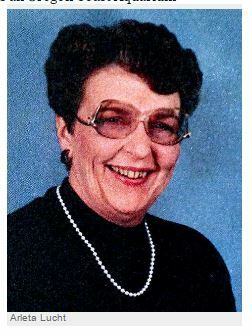 She was an active member of Grace Lutheran Church in Molalla. After Paul died, she moved to Newport, where she worked as an Oregon Coast Aquarium volunteer. Survivors include her sister, Gloria Cornelius of Salem, her sons, Mark and Les Lucht and her daughter Angela Pak. Her oldest son, Craig, preceded her in death when he was just 19. Donations can be made, in her honor, to Dybvad/Lucht Scholarship (Molalla High School) or the Oregon Coast Aquarium.